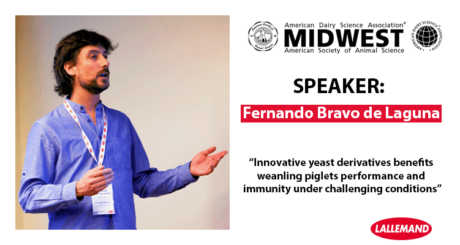 The study presented by Fernando BRAVO DE LAGUNA R&D Swine Project Leader indicates that, an innovative multi-strain yeast fractions product is able to alleviate the adverse effects of challenging sanitary conditions on weanling piglets. 1Bravo De Laguna Fernando, Bertaud Bruno, Yong Min Kim, In Ho Kim. Effect of yeast supplementation on growth performance, nutrient digestibility and cytokines mRNA expression in weanling piglets reared under low sanitary environment.